Here are some popular ground covers for sun. Some are low-growing woody shrubs and others herbaceous perennials. Bearberry Cotoneaster (C. dammeri): Pronounced Co-toe-nee-as-ter. Low-growing shrub hardy from Zone 4 to 8. Evergreen, but loses foliage in colder regions. Glossy leaves, tiny white flowers in late spring. ‘Skogholm’ produces glossy red berries, ‘Coral Beauty’ coral berries. Grows 12 inches (30 cm) tall. Excellent ground covers for sun on banks or slopes. Spacing: 3 to 5 feet (90 cm-1.5 m) apart. Low growing evergreen Shore Juniper (Juniperus conferta) cultivars ‘Emerald Sea’ and ‘Blue Pacific’ make good ground covers for sun, and they are hardy from Zone 5 to 9. They are salt-tolerant and grow 8 to 12 inches (20-30 cm) tall. Space: 5 to 10 feet (1.5-3 m.) apart. Creeping Juniper (Juniperus horizontalis) cultivars are hardy from Zone 3 to 9. ‘Bar Harbor’, ‘Blue Chip’, ‘Emerald Spreader’, ‘Prince of Wales’, ‘Turquoise Spreader’, and ‘Wiltonii’ (also called ‘Blue Rug’) are all excellent. Spacing: 3 to 5 feet (90 cm-1.5 m) apart. Cutleaf Stephanandra (Stephanandra incisa ‘Crispa’): Low, wide-spreading deciduous shrub with arching branches; hardy from Zone 3 to 7. Tends to root wherever stems touch soil; while it’s a good ground cover for sun, it also tolerates light shade. Does not have showy flowers. Grows 18 to 36 inches (45-90 cm) tall. Spacing: 3 to 5 feet (90 cm-1.5 m). Fragrant Sumac (Rhus aromatica ‘Gro-low’): Low, spreading deciduous shrub hardy from Zone 3 to 9. Glossy foliage, fast-growing; an excellent ground cover for sun, and for banks or slopes. Red fruit in late summer. Salt- and shade tolerant, grows 2 feet (60 cm) tall, spreads 6 to 8 feet (1.8-2.5 m). Spacing: 3 to 4 feet (90-100 cm) apart. Lilyturf (Liriope muscari): Perennial hardy from Zone 6 to 9. 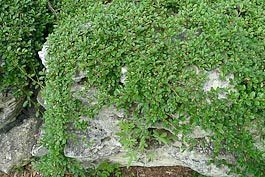 This groundcover for sun is very popular in the south, where it is evergreen. Blue, purple, or lilac flower spikes and strap-like leaves. Foliage solid green or variegated in yellow or white. Grows 9 to 12 inches (22-30 cm) tall. Shade-tolerant. Spacing: 8 to 12 (20-30 cm) inches apart. Thyme (Thymus species): Herb hardy from Zone 4 to 10, depending on cultivar. It’s one of the great groundcovers for sun. Small gray-green or green or golden leaves, with rosy-pink or lilac flowers. Valued as mat-forming grower for well-drained areas. Will take light foot traffic. Spacing: 12 inches (30 cm) apart.